ESTA was created over 30 years ago by Belfort industrialists with the aim of training Sales Engineers skilled in selling technical products on international markets. Right from the start, the cursus has been tailored to the expectations of the school’s founders, focussing on four educational pillars. The education is enriched by intensive language training (English and German/Spanish/Italian) and by nearly two years of professional experience through five placements in companies, including one six-month overseas placement. ESTA is the only school in France offering such a Sales Enginieering cursus over five years, with technical and commercial aspects integrated as from year one. More than 1000 ESTA graduates have become the school’s ambassadors by applying their skills to the benefit of their respective companies. ESTA graduates are much sought after in industry, and more than 90% of graduates have a job contract by the time they obtain their diploma. 90% of ESTA students secure a job contract before obtaining their diploma. ESTA is the only school in France offering a Sales Engineering cursus over five years, or over three years for students having successfully completed a two-year technical diploma. 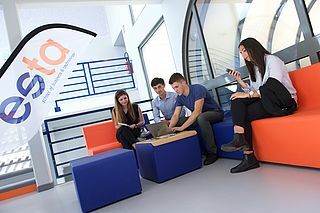 The studies are characterized by a multidisciplinary programme where students switch daily between technological, sales, marketing, management and other subjects. At ESTA, students follow a challenging study programme, where lectures from different educational pillars alternate daily. As classes are small, there are no options to choose, so all students follow the same courses. Technical subjects and practical exercises are dealt with by teachers from the nearby Technical University Belfort Montbéliard UTBM for ESTA Belfort.